Hi folks, I hope you’re doing great! Here’s another post about the English language from gloomy and rainy French Riviera (very unusual, I know! ), but perfect weather for blog writing. Let’s start with “as well“, which is quite easy to use because it’s similar to also and too and means “in addition to”. As well and too are used at the end of the sentence and are more commonly used in speaking, while also is used before the main verb and is usually used in writing. Check this out below. “As well as” also means “in addition to”, but it’s used with two terms. Look at this example: On holiday he went skiing as well as hiking. As well as is between two activities: skiing and hiking. Here is another example: We visited the fortress as well as the museum. He plays the piano very well. Well is an adverb here, as it describes the verb to play, an action. When it’s an adverb “as well as” can work as a comparison expression with as… as, when two situations are equal in some way. He plays the piano as well as his brother. Bonus! Here’s an idiom you can learn: “It’s as good as it gets”. ‘He keeps on looking for a new job, but I think his current job is as good as it gets’ – a situation that can’t be improved. 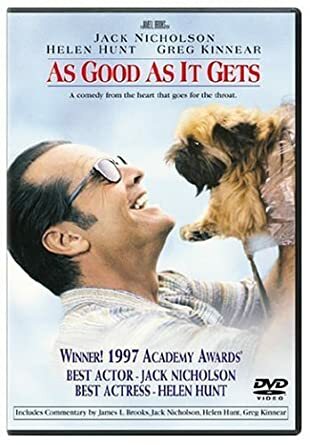 There’s also a famous film called ‘As good as it gets’, a true classic from 1997, which star Jack Nicholson and Helen Hunt as lead actors who got 2 Oscars for their performances. I highly recommend it! Check out my previous posts, like The 10 Most Common Mistakes Learners of English Make or Speak to or Speak with? That’s all from me. Send me your thoughts, comments and requests. I’d love to hear from you! 🙂 See you here next week! Previous Speak to or speak with? Next Christmas shopping? Love it or hate it!